Antazoline HCl is a first generation antihistamine, binding to the histamine H1 receptor and blocking the action of endogenous histamine. Cetirizine DiHCl is an antihistamine. Epinastine is an antihistamine and mast cell stabilizer that is used in eye drops to treat allergic conjunctivitis. Olopatadine HCl is a histamine blocker and mast cell stabilizer with an IC50 of 559 μM for the release of histamine. Buclizine HCl is an antihistamine and anticholinergic of the piperazine derivative family. Rupatadine is an inhibitor of PAFR and histamine (H1) receptor with Ki of 550 nM and 102 nM, respectively. Azatadine is an histamine and cholinergic inhibitor with IC50 of 6.5 nM and 10 nM, respectively. Carbinoxamine maleate is a histamine-H1 receptor blocking agent with antihistamine and anticholinergic properties. Doxylamine succinate competitively inhibits histamine at H1 receptors with substantial sedative and anticholinergic effects. Betahistine is a histamine H3 receptor inhibitor with IC50 of 1.9 μM. Mianserin is an potent antagonist of H1 histamine receptor and 5-HT serotonin receptors, used for the treatment of depression. Bepotastine is a non-sedating, selective antagonist of the histamine 1 (H1) receptor that is indicated in allergic rhinitis, urticaria, and pruritus associated with skin disease. Mebhydrolin Napadisylate is classified as an antihistamine drug classes used to treat allergies. Levocetirizine is the active R-enantiomer of cetirizine and represents a new second-generation histamine H1 antagonist. Diphenhydramine HCl is a first-generation histamine H1 receptor antagonist, used in various allergic conditions such as rhinitis, urticaria and conjunctivitis. Desloratadine is a potent antagonist for human histamine H1 receptor with IC50 of 51 nM. Chlorpheniramine (Chlorpheniramine maleate, Chlorphenamine) is an histamine H1 receptor antagonist with IC50 of 12 nM. Ciproxifan is a highly potent and selective histamin H3-receptor antagonist with IC50 of 9.2 nM, with low apparent affinity at other receptor subtypes. Meclizine is a histamine H1 receptor antagonist used to treat nausea and motion sickness, has anti-histamine, anti-muscarinic and anti-oxidative phosphorylation properties, also an agonist ligand for mCAR (constitutive androstane receptor) and an inverse agonist for hCAR. 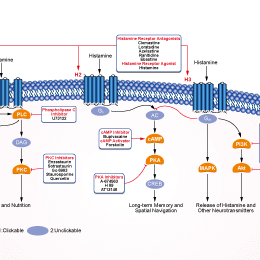 Cimetidine, a histamine congener, competitively inhibits histamine binding to histamine H2 receptors. Lafutidine, a newly developed histamine H(2)-receptor antagonist, inhibits gastric acid secretion. Tripelennamine is a widely used H1 antagonist, inhibiting PhIP glucuronidation with IC50 of 30 μM. Cyproheptadine HCl is a hydrochloride salt form of cyproheptadine which is a histamine receptor antagonist. Hydroxyzine is a histamine H1-receptor antagonist, inhibits binding of [3H]pyrilamine/[3H]desloratadine to human histamine H1 receptor with IC50 of 10 nM/19 nM. Ebastine is a potent H1-histamine receptor antagonist, used for allergic disorders. Cyclizine 2HCl is a piperazine derivative with Histamine H1 receptor antagonist activity. Pheniramine Maleate is an antihistamine with anticholinergic properties used to treat allergic conditions such as hay fever or urticaria. S 38093 is a histamine H3 antagonist/inverse agonist with a moderate affinity for rat, mouse and human H3 receptors (Ki = 8.8, 1.44 and 1.2 μM, respectively) and no affinity for other histaminergic receptors. Bilastine is a new, well-tolerated, nonsedating H1 receptor antihistamine and has a rapid onset and prolonged duration of action. Doxepin is a tricyclic antidepressant formulated as a mixture of E-(trans) and Z-(cis) stereoisomers. It inhibits CYP2D6 activity in vivo. Promethazine HCl is a potent histamine H1 receptor antagonist, used as a sedative and antiallergic medication.